Due to Mercy’s many commitments this weekend (not to mention the chai party), the only time we could have her birthday dinner was at lunchtime on Sunday. Fortunately, she had requested curry, which can be made in the slow cooker, so all I had to do was get up early after staying up late and get the curry going in the slow cooker and rice going in the rice cooker before going to church. Then it was on to church where I had two hymns to play and our violinist joined in and it went okay. Not great, but not terrible either. After church Spencer brought Kat and we all sat down to a delicious and spicy curry dinner. Then Mercy had an event to work at on campus. I got Jasper to go outside with me and try on the booth roof. It fit. It’s a tiny bit loose, but that’s what I was hoping for. It’s a lot better than finding out it’s too tight! 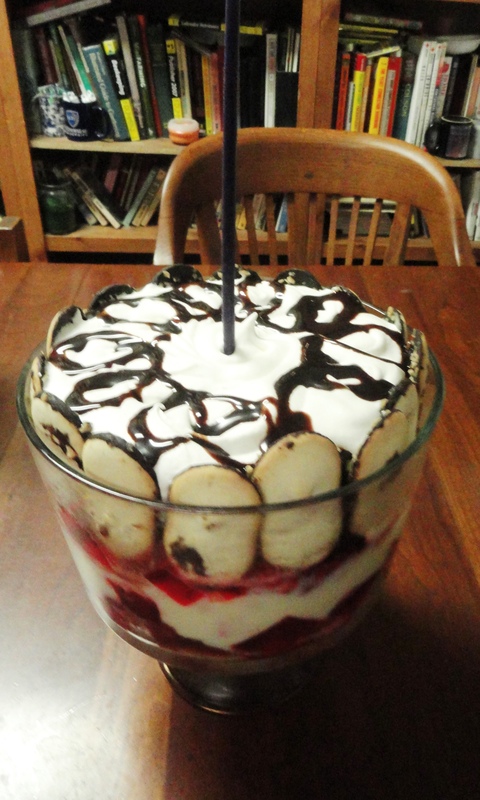 I also had a time-consuming dessert to make, but of course I was happy to do it for the birthday girl. Flynn had asked me to cut his hair while he was here, so I squeezed that into the afternoon as well. Supper was a little disjointed because right as everyone (including Jonnie and Jonny) were sitting down to eat, I had to take Lucy to a youth event, where we had a run-in with a frustrated pizza delivery man who was there early and had no one to deliver pizzas to! After everyone got back home, we finally had Mercy’s birthday dessert. She had requested trifle instead of cake (much to everyone’s delight), so I just had one long candle in the middle. After we sang to her, someone joked that she wouldn’t have to worry about blowing out all the candles since there was only one. She failed to blow it out on the first try, and we all cracked up. The trifle was delicious. 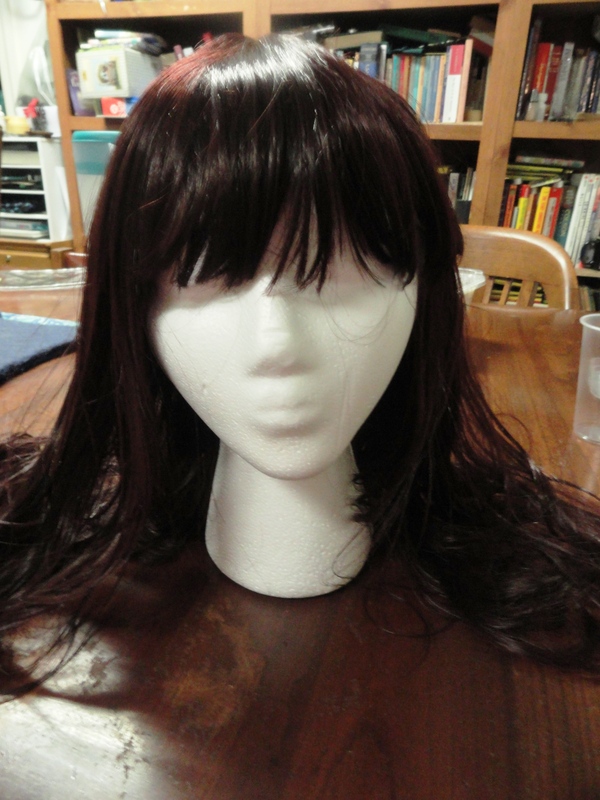 Flynn wants the wig for a costume, but Jennifer’s hair was too long, so he wanted me to cut it. I’ve got to admit, I didn’t try too hard to style it. I’m pretty sure Flynn does not want it to look girly. I got the hair cut to about shoulder length, and then tried it on Flynn to do the final trimming. I was not allowed to take pictures. I have a feeling that Jennifer will make her internet debut at the end of next month. Today I really wanted to work on my booth but instead I frantically tried to prepare for my two classes and help Jasper with school and finally finally finally mailed my defective phone back to Verizon. It only took them over 3 weeks to get a shipping label to me. So, this evening has been all about the booth. I got the “pantyhose” ironed and did a little finishing work on them. Tomorrow they’ll get ties at the top so I can attach them to the corners of the booth. Then I started pinning together the ruffle sections. I didn’t measure exactly, but I can tell you I have a minimum of 72 feet of fabric sewn together in a gigantic loop. Tomorrow I’ll iron it and gather it and I hope sew it to my moldy-looking particolored roof. Then it will be time to turn my attention to the buckets. Did I mention the buckets? We have to have some way to anchor our booth so it won’t blow over in case of wind. Whatever we do, it can’t look modern. So, I came up with the idea to use four of our big chlorine buckets, which we will fill with water on site. Walter is going to help me figure out a workable way to tether them to each of the pantyhose-clad legs. But of course the buckets now need costumes too. So I will cover them with fabric and then they can serve as impromptu seating. Yeah, there’s no way we’re going to even break even this weekend. The startup costs are killing me! My credit card reader arrived today, and even though the reader is free, the monthly fee is pretty steep by my standards. So I will pay for one month and then cancel . . .
One of the hymns I played in church this morning and a longtime favorite. Less than a week to go! The next week is going to be very short on sleep and long on work. Today got off to rough start when Lucy and I went out to go grocery shopping and the car did not start. AGAIN. On a Saturday morning! Why, oh why does that car refuse to work on Saturday mornings? So we had to take the van and then after we got back, Walter tried to start the car and it started! Which was a good thing because I did have to go out and get some things that Walmart hadn’t had. My big, intimidating job for today was to try and sew a booth disguise. Because we will be at a renaissance faire, our booth is not supposed to look “modern” in any way. A pop-up gazebo must be in costume just like its occupants. I had the kids put up our largest gazebo, only to find that it is broken. So, by default we will be using the 10-foot-square one that actually works. I borrowed one of Walter’s tape measures and took a lot of measurements and wrote them down and did sketches. Geometry was involved. Geometry and I are not friends. Once I thought I had worked out the size and shape of the triangles needed, I got Jasper to help me lay the four sheets out on the living room floor. These are the same sheets that I dyed in my washing machine and which now look as if they are slightly moldy because our fancy new washing machine wouldn’t let me put enough water in to really do the job well. Once the sheets were flat on the floor, there was more measuring, geometry, and marking with chalk. I had to get Lucy to cut out the pieces for me because my knees are way past the point where I could kneel or crawl without excruciating pain. The cuts were not the smoothest lines in the world because Lucy doesn’t really enjoy crawling around on the floor either. This didn’t take all day, obviously. We also did some painting and some finishing of our flower fairies and stuff. And Mercy did almost all the work getting ready for the chai party. By supper time I was ready to sew the roof triangles together. It will be a parti-colored roof because there weren’t enough sheets of one color to do that. I would never have attempted this job if my serger weren’t back in working order. The serger was very hot by the time I got the main part of the roof sewn together. Tomorrow we’ll take it outside and find out if I did the math right and it actually fits. I still had to do more painting and then cut out the fabric for the ruffles. I’m pretty sure that the Walmart where I shop has had a puzzling increase in sheet sales. I got more sheets this morning because we will need to cover our tables also. Then it was time to tackle the post pantyhose, as I call them. Booths aren’t allowed to show their naked metal legs. They must be covered. So I cut yet another sheet into strips and sewed them into tubes which will cover our booth posts. At that point they will be cross-gartered to make them more attractive. No one is going to be able to say that I didn’t follow the rules! Flynn has been here all day and it’s been a joy to have him. Tomorrow I need to finish the booth costume and work on bucket camouflage. After we celebrate Mercy’s birthday by eating curry. Today didn’t turn out at all like I had expected. I was expecting to have lunch with one friend and then a visit with another. The first friend never got the email saying I was free today, so she made other plans. I worked on faire stuff and then went out for what I hope was a final supply run. When I got back I worked on some of my handwork while waiting for my other friend. When she hadn’t arrived by her usual time, I texted and found out that she wasn’t coming after all. Now in a way this was good because it meant I could really concentrate on making stuff. On the other hand, I was really looking forward to spending time with friends! It’s after midnight again, so I’m headed to bed. However, I want to say that thanks to an alert reader, I am changing the name of “fairy pockets” to “fairy wallets.” I promise tomorrow I will try to do photos. I’m done with the wallets now and am going full speed ahead on carrot cases. Isn’t that a beautiful number? That’s how many fairy pockets I have made by hand since the middle of August. My original goal was 100. Then, because they were so cute, I started thinking, what if people actually like them and want to buy them? I don’t want to run out . . . . So now I have 302 of them. I’m done. I have so much other stuff to make. 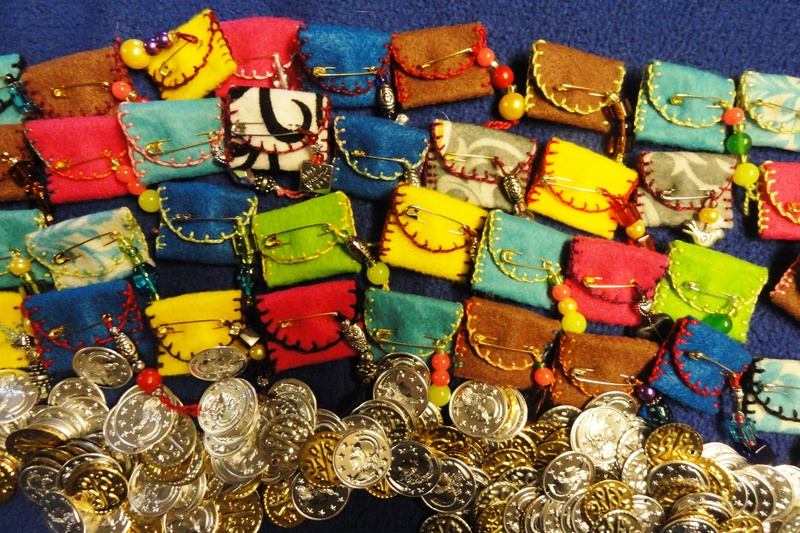 Still, I really hope people do like and buy my fairy shillings and the little pockets to put them in. In less than 2 weeks I’ll know! I also finished another muff today and started a new one. Lucy doesn’t think anyone will want or buy muffs because of our warm climate. If she’s right, I guess I have the beginning of a gift stockpile for my northern friends! We had piano lessons today and Jasper came with me to get him signed up for Harvest Festival. All he wants to do is make two cakes this year. Last year was kind of disappointing, so I’m okay that he’s not doing a ton of stuff. Besides, it’s the same weekend as my writers’ conference and Zambian Independence Day! I talked to my brother in the hospital today. His knee surgery went well, but he is in a lot of pain and taking a lot of meds, so he wasn’t much of a conversationalist. Praying for a quick recovery. Ever had one of those days when you just really, really needed someone–one person–to tell you that you did something–one thing–right? I’ve had a lot of those days lately, and today was worse than most. I had a very stressful morning trying to do school with Jasper and figure some stuff out and rip a CD to my computer so I could give the original back to my autoharp teacher. I had grouchy kids and I felt like I was the biggest failure on the planet. Then I had to leave for my autoharp lesson and I was running a few minutes late because of all that other stuff, and I really was embarrassed to even go because I did not really practice anything but the hymns I had to play for church. But I hadn’t had a lesson in a month and I didn’t want to start thinking I didn’t need help, because Lord knows I need it desperately. Besides, it is such a beautiful 90 minute drive up there. I was still rather out of sorts when I arrived at my teacher’s house–especially since I had missed my turn and made myself even later than I already was. My teacher lives out in the country, literally at the end of the road. Her home is surrounded by a beautiful flower garden, and beyond that, orchards and hay meadows. The setting is idyllic. It’s hard to stay grumpy in the middle of all that beauty, so I was beginning to relax even before I knocked on the door. My teacher is such a sweet lady and she has a wonderful way of putting me at ease. But still, I had to confess to her that I’d barely glanced at the assignments she gave me. She laughed it off and asked me to play a hymn that I’d played in church on Sunday. So I played it, and she was very happy with my performance. It seems that my style of playing is actually considered “advanced” because I do my best to pick out the melody so that people can sing to it. Apparently a lot of autoharpists never progress beyond playing chords for accompaniment. But the point is that I really, really needed to hear that I am doing something right, and it was such a balm to my rumpled spirit to hear someone praise my musicality and technique, because I’ve been working very hard. This is one reason why I love my lessons so much. My teacher is the only person in the known universe who respects me as a musician or even believes that I am one. Everyone else finds my new hobby either amusing or irrelevant. It was suggested to me that I should stop taking lessons because after all, I have already reached my goal of being able to accompany the singing in church. On the one hand, this is flattering, but on the other hand, the assumption behind the suggestion is that I should be satisfied with stumbling through a couple of hymns once a week for all eternity. It’s true that I volunteered to play in church because I was desperate for there to be some instrument to accompany the congregational singing, but that was never, for one instant, my ultimate goal. As I’ve said before, I have wanted to play the autoharp for my entire life since the age of eight. I don’t want to be mediocre at it. My personal goal, from day one, has been to master the instrument and play it well, and that is still my intention. What some people, such as my own offspring, don’t realize is that I have always loved music. I don’t blame them. I know that my kids look back over their short lives and can’t find any evidence that their mother has a single musical molecule in her body. They’ve never seen or heard me play the piano, for instance, although I did have several years of piano lessons (I’m too embarrassed to play in front of them). Apparently none of them remember the countless hours I spent singing to them as babies. What they don’t realize is that music is one of the things I gave up in order to reach other goals, such as getting a degree and raising a family. My musical ability didn’t somehow fade or fly away or disappear. I made a choice to put it on the back burner in order to accomplish other things. There were times when my inability to get music out of my head and into the air was very painful. I could sing, of course, and I did, but I wanted so badly to be able to make music with something other than my voice. I just kept pushing that part of me back into some interior closet and slamming the door because I knew I didn’t have time to pursue it. It’s always been rather amusing to me that my kids, all of whom have had to take some form of music lessons at my insistence, and most of whom consider themselves to be musicians, would also believe that their musicality just somehow fell from the sky and has nothing to do with genetics and certainly has nothing to do with me. My teacher has questioned me about my family’s music history, and every time I exceed her expectations she comments on how fortunate I am to have such a musical background–a background that is invisible to my kids! So anyway, it was good to get that affirmation up there in the country, in that lovely place surrounded by more loveliness. I needed that little oasis. As I was leaving my lesson I got a puzzling text from an unknown person. It said, “In my room; all went well; doped up!” I had no idea who it could be from. I didn’t recognize the number. (None of my phone contacts transferred to my new phone.) For some time, as I drove toward home, I thought about it and concluded that it must be a wrong number. Who on earth would send me a text like that, other than my son Flynn? I knew it couldn’t be Flynn because I’d recognize his number, and I’m pretty sure I’d know if he was in the hospital. After over half an hour of wracking my brains, a result emerged. I realized that today must be the day of my brother’s knee surgery. For some reason I thought it was later this week. Suddenly everything made sense! I didn’t actually go home after my lesson because I had critique group followed by our monthly writers’ meeting. It was a good time but I was ready to come home when the meeting ended. I barely got my quota of fairy pockets made today! Once again it is past midnight and I am woefully underprepared for my lesson tomorrow. However, I did grade papers, prepare for and teach two classes today, make 10 fairy pockets, knit several inches, practice my autoharp and work out some chords. I’m going to go to bed and try to catch up tomorrow. So sorry I forgot to put this up yesterday . . . Sorry about yesterday’s silence. I am trying to place a little more priority on sleep than I have been doing lately. If it’s late at night and I’m exhausted, I will try to pick sleep over blogging. This morning when Jasper and I went out to get in the car and go to Walmart, guess what happened? You guessed that the car didn’t start, didn’t you? Yes. For at least the fourth time on a Saturday morning, the car did not start. I had to go back in the house to get the van keys so we could still go grocery shopping. We don’t understand what the car has against going out first thing on Saturday morning, but it’s been a consistent pattern. Thank goodness my husband was able to get it going again when he got home from work. After also fixing our hot water heater. Today was a pretty productive day in terms of making things for our booth. Lucy got her earrings packaged for sale and I put the finishing touches on the muff I’ve been knitting. Then this afternoon I decided the time had come for Lucy and me to tackle making flower fairies. All we had for inspiration was a little leaf fairy that Lina made many years ago. After taking apart a lot of silk flowers and experimenting with toothpicks, I finally came up with a basic design that worked. It was a very tedious and time-consuming job making 40 little fairies, but when we finally finished this evening we had some really cute creations! I also had a new appreciation for hot glue. Oh, and I just now remembered I have an instrument to tune . . .